One last trompe l'oeil that is. On Friday, I showed a couple of photos of Classical Roman decorative painting and then a church in Rome. Let me just state for the record that nowhere on the planet offers such bountiful rewards to a solitary walker than the city of Rome. I will repeat that to anyone who listens (or who doesn't listen) for the rest of my life. Ottorino Respighi captured the exitement and glory of a walk in that city in his first movement from I pini di Roma. Listen to it sometime. It makes me weep like a child. Really. Blubbering hysterics. Anyhow, during another on of my Rome walks I came across the Church of St. Ignatius Loyola. I had no idea what the Church of Ignatius Loyola was until I opened the door and walked in. Sant'Ignazio is a baroque church that opened its doors in 1650, and was the project of Jesuit architect Andrea Pozzo. In my readings since I walked into that church, I've learned that Sant'Ignazio is considered to be the pinnacle of Baroque painting. And here's why. Photos cannot come close to capturing the effect of this ceiling. 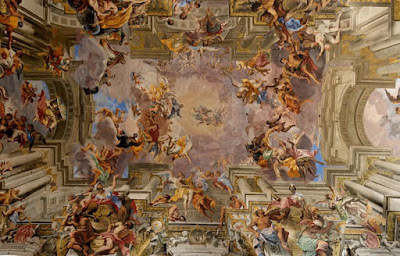 When you stand in the center of the church and look up, this painting completely fills your field of vision, and it's probably 100 feet in the air. You also lose sight completely the fact that this ceiling is flat. It appears to extend upward into infinity. Terms like breathtaking get thrown around pretty loosely, by me particularly; but I never experienced true breathtaking-ness until I saw this. 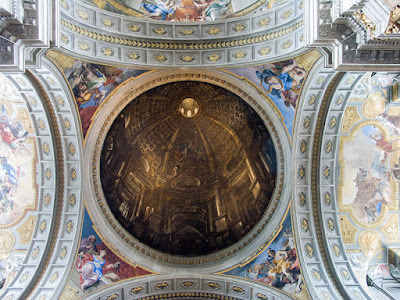 And if that weren't enough, as you look forward and toward the altar, you look up into the dome of the church. Or you look up to where a dome ought to be, only it's another, perfectly flat ceiling painted to look like the inside of a dome at dusk. Pozzo completed these paintings more than 325 years ago and his motives and excitement for the subject matter are still palpable, regardless of a viewer's religious inclinations. For some reason, the Church of Saint Ignatius doesn't merit a whole lot of mention in the tour guides to Rome, but it affected me more than any other religious building in Rome did, that's for sure. Maybe because I stumbled upon it when I was walking by myself --it felt like my own private find. It's tucked into its own piazza not too far from the Pantheon. Some day when I want to prattle on about exquisite marbles, I'll bore you with some Pantheon photos. Hah! Back to kitchen design: framed or frameless?